Happy Wednesday y’all! I hope you’re week has been great so far! 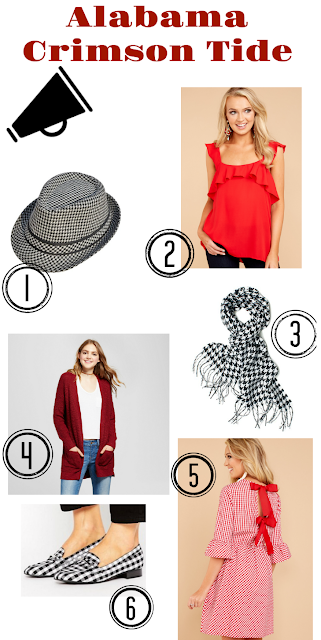 Today I am talking about my two favorite things; football and fashion! I love the SEC and being from the south I felt that it was only fitting to throw together some outfits for game day. I will be putting together some cute outfits for each South Eastern Conference team starting with the West. Next week I will be sharing outfit ideas for the East. I am so excited, let's do this! I had to start with the best.. obvi! Roll Tide Y'all! .. And now the worst team. HAHA! As much as I hate to admit it, I really love the navy and orange combo (don't tell my daddy)! Look at those darling shoes! I love Texas A&M's colors. I also threw in that watch because the black and gold together is STUNNING! This one was hard because a lot of the same things you saw in Texas A&M's outfit ideas you could really use for Mississippi State also. Again, such a great color and one that is very popular during the Fall and football season! LSU doesn't have my favorite colors but these pieces I found I LOVE. Especially the mustard colored cardigan which is perfect for Fall regardless of what team you cheer for! How cute is all of these pieces? I again, can't help but love these flats for the team with the razorback on the bow. I love Ole Miss colors because it is so patriotic! How cute is that plaid dress?? Well there you have it! I hope you loved all these outfit ideas! Talk to you on Friday!